Pokemon names with normal text color can only be found in both versions. Pokemon names with this color are exclusive to FireRed. Pokemon names with this color are exclusive to LeafGreen. Welcome to the world of Pokemon on Pokemon FireRed and Pokemon LeafGreen. This is a remake of the original Pokemon RPGs, so many things are alike. The game starts with a cool intro that is almost exactly like the intros in the original games. It then prints instructions on which buttons does what. After reading what the game has to say, you'll see Professor Oak (Prof. Oak from now on), talking about Pokemon. He first wants you to know if you're a boy or a girl, and then allows you to choose your name. Then you'll choose your rival's name. 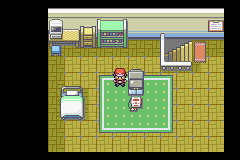 After a bit of talking with the Professor, you'll find yourself in your bedroom in the peaceful Pallet Town. The first thing you want to do is go to your PC at the top-left hand corner of your room and take out the Potion. This restores 20 HP, and will be helpful real soon as you're about to find out. Go downstairs, talk to your mom, and go outside. Go north into the grass area. Prof. Oak will come to tell you that it's dangerous to go on without a Pokemon. He'll take you to his lab, where your rival (known as Gary from now on) is waiting. He asks you to choose a Pokemon. Go to the table with the three PokeBalls and choose the Pokemon of your choice. A cute little frog-like Pokemon that can launch powerful attacks. This is the best choice for beginners, as it can take on the Pokemon in the first four Gyms easily. A turtle loaded with gallons of water. The level of difficulty of choosing Squirtle is medium. It has certain advantages in the beginning, but begins to have disadvantages faster than Bulbasaur. Little fire-breathing salamander. The hardest Pokemon to choose because of the many disadvantages in the beginning. However, it will become very powerful later on. Each Pokemon has its own advantages in the game, so choose wisely. It is suggested that beginners choose Bulbasaur, since it's a Grass-type and is strong against the Pokemon in the first Gym, which are Rock-type. After choosing your Pokemon, Gary will come over to the table and choose his Pokemon, which will have an advantage over your Pokemon. 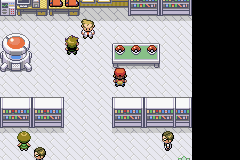 For example, if you were to choose Bulbasaur, Gary will choose Charmander. He'll talk to you afterwards, and as you leave, he'll challenge you to your first battle. Be careful during this first battle, as Gary's Pokemon is stronger than yours, even though you both have lv. 5 Pokemon. The Potion may come in handy now. During this battle, you'll constantly be interrupted by Prof. Oak's tutorials. The good thing about this battle is that you get some money if you win, and your Pokemon's level is instantly raised to 6. Now leave the city and go North into Route 1 and towards Viridian City. Try to level up in this route. When you get damaged, be sure to either go back to your house for a free healing from your mom, or to the Pokemon Center in the next city. Talk to the first person you see for a free Potion. Sooner than you think, Route 1 is coming to an end.